These are very popular Indian snacks which I find are perfect for a family gathering. These potato balls are a deep fried savory appetizer made with spicy potato mix dipped in gram flour batter. Grate the boiled potatoes in a large mixing bowl. To this add chili, garlic, salt, and garam masala. Mix it well. Take the gram flour in a separate bowl with salt, turmeric and chili powder. Add the water to this, little at a time, mixing the whole time with your hands to make the batter. It should not be too thick or too runny. Heat the oil in a deep fat fryer to 180°C. Take around one tbsp of the potato mix in your palm and shape them into small balls. You can shape them as big or small as you like. 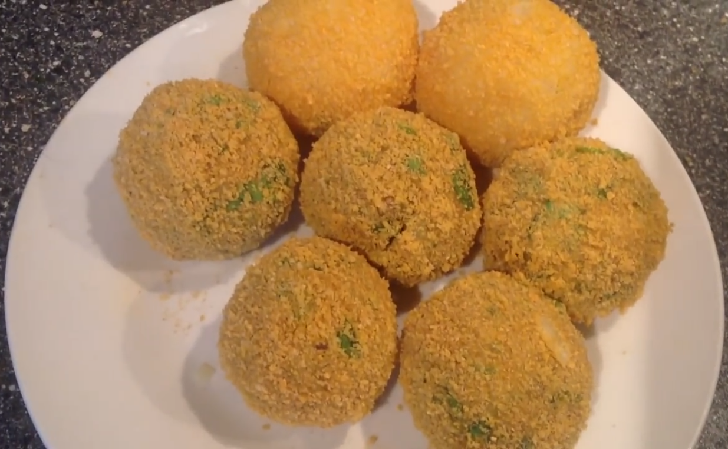 Dip these balls, one at a time in the batter, carefully covering it properly all round. Deep fry them for about 3-4 minutes on each side until golden brown. Serve them hot with any chutney of your choice or a simple ketchup.